The Grace Cardi from my Finish-Free Knits book is one of my favorites! Well, I really love them all, but there are a handful of them that are just a little special to me. This is one of them. What makes this one of my favorite designs is its visual simplicity, but how so-much-fun it is to knit! And, I've used my favorite brioche stitch pattern around the cuffs and lower edge. 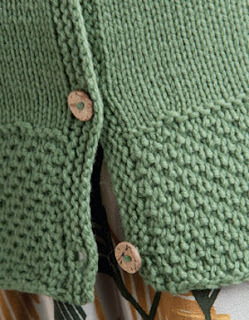 Side-to-side construction makes this cardigan interesting in style and technique. Beginning at the center back, each half of the bodice is worked outward to the sleeve cuff. Stitches for the body are picked up around the lower edge of the bodice and worked downward to the lower edge. The sleeves and lower body are bordered with pearl brioche stitch—one of my favorite patterns for simple texture! There are a variety of techniques used in this cardi that may be new to some people. Please don't let that frighten you away! The pattern calls for using the Long-Tail Cast-on Method, but really your favorite cast on could be used in place of this. There is also a provisional cast on used at the center of the back. I choose this method of casting on because it maintains live stitches at the cast-on edge that can be picked up and worked in the other direction, without it being visually obvious! 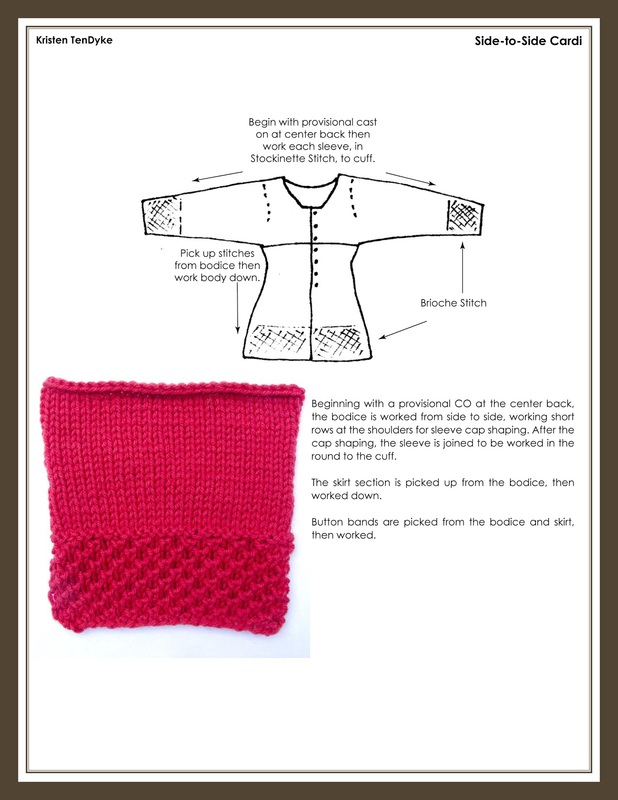 There are illustrated instructions for this and the Long-Tail method on page 151. The crochet provisional cast-on that I use is slightly different from what's in the book. Here's a great tutorial I made once upon a time for Classic Elite. There are also a bunch of short rows worked to shape the shoulders into sleeve caps. If you've ever knitted a sock with short row heel shaping, it's very similar to that. If not, don't fret—there are detailed instructions and illustrations on page 157 explaining what we mean by "wrap and turn" and "working together with the wrap". There's a little bit of counting, but it doesn't last long. Once you're past the cap shaping it's simply knitting through the rest of the sweater! And my very favorite thing about this sweater is the Pearl Brioche Stitch pattern at the cuffs and lower edge! It's such a great feeling stitch with extra thickness and bounce—I just love it! To get an idea what this brioche stitch pattern is like, think of garter stitch, except on one of the rows every other stitch is slipped and the yarn is wrapped over the needle instead of through the stitch. The next row is just knitted, but we work that yarn over together with the slipped stitch from the previous row. There are detailed instructions for that too—for both in the round and working back and forth in rows. I love this sweater so much that even though I asked another knitter to make the sample for the book, I'm in the process of making another one right now!